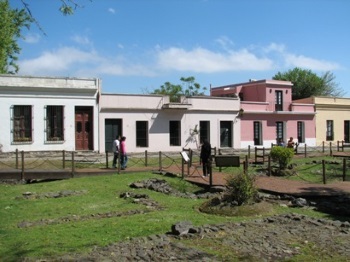 The Historic Quarter of the City of Colonia del Sacramento is a fusion of Portuguese, Spanish and post-colonial styles. The buildings date from the 17th, 18th and 19th centuries. Its street plan is organic, contrary to the general checkerboard layout used elsewhere in colonial Latin America. 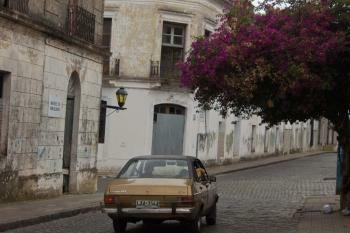 Colonia, situated on a peninsula, was first settled by the Portuguese in 1680. Portuguese sovereignity was much disputed by the Spanish during the first decennia. They besieged the town and control changed hands several times. The Spanish empire finally took hold of this strategic post on the Río de la Plata in 1777. Colonia is the antithesis of Buenos Aires (BA): while the Argentinian capital has grown into a modern city of millions, its Rio de la Plata neighbour has turned into a quiet backwater. BA looks to have taken the better road economically, but Colonia has beaten them at least on one aspect: it has gained world heritage status, something BA still only can hope for. I 'did' Colonia the way most of the people do - by ferry from BA. This is a very easy way to pick up a new country also, although I can't really say that I've learned to know the soul of Uruguay after a one-day visit. I didn't even touch Uruguayan pesos: I tried to get hold of them but all the banks were closed and the only ATM I could find didn't like my card. So I just paid in Argentinian pesos, and even got the change back in that currency. One thing is different though: there's a one hour time difference between Uruguay and Argentina (although that's only temporary)! So what's to see? The main thing that struck me was the general laid back atmosphere, softened even more by the leafy streets and abundance of flowers. One just has to walk around slowly, admire the nice little old buildings and have a meal or a drink. A couple of houses are turned into little museums, which are worth a look. In one of those I encountered a fossilized Glyptodon - that's a very big and scary looking cross between a turtle and a armadillo ("about the same general size and weight as a Volkswagen Beetle", according to Wikipedia). Colonia in general is a nice little town, very well suited for a leisurely Sunday outing. Similar sites would be Macao (also a WHS) and Paraty (hoping to become one soon), although I rate these two higher than Colonia. 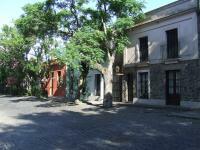 What Colonia del Sacramento lacks in single sights it makes up for atmosphere. You can climb the lighthouse, visit a small Basílica and walk along the Muelle de Puerto de Yates but what will remain are general memories of a picturesque, laid back and ageing townscape. Overall well worth the detour from Buenos Aires (with the Buquebus ferry) or Montevideo. The Historic Center of the City of Colonia del Sacramento in Uruguay is a perfectly adequate World Heritage Site, but, as has been intimated by other reviewers here, it would likely not fall in the top tier for many WHS travelers. Like others, I visited the town as a day trip by ferry from Buenos Aires in March 2016. The weather was warm, which made the stroll around the historic cobblestone streets of the historic quarter rather pleasant. I appreciated the tile maps of the city found throughout the historic quarter, and also enjoyed the overhead views of the city from atop the lighthouse. Scattered around the quarter were several old cars that had been turned into artwork, and antique lamps were hung from the sides of many of the buildings. Before returning to Buenos Aires, my friends and I enjoyed a relaxing late lunch at a cafe overlooking the Rio de la Plata and some of the old city walls on the south side of the historic quarter. Although my visit to Colonia del Sacramento gave me an opportunity to see Uruguay for the first time, I think I'll have to return for a longer visit some day to get a better feel for the rest of the country. 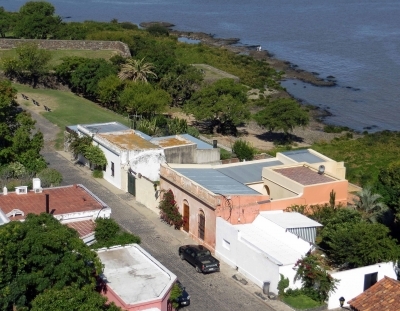 Logistics: Colonia del Sacramento is accessible by ferry from Buenos Aires; the historic quarter is a short walk from the ferry terminal in Uruguay. Be sure to plan time to go through customs in both countries. I am a bit torn about my view on the town. It is quaint and cute but I also found it a little boring. Maybe I was missing something but it wasn't as photogenic as I was hoping and there weren't a lot of things to do. I only stayed one night and felt like that was long enough. It certainly was not a bad experience - just not particularly memorable. 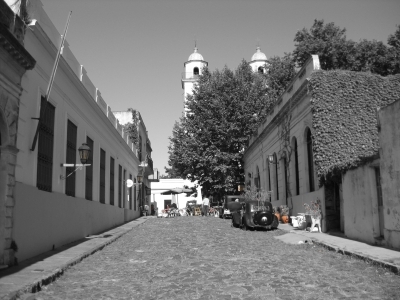 I went to Colonia del Sacramento in March 2013, arriving - unusually - by air. Once our Cub had landed at Colonia's airfield we had to call customs and wait for them to drive over from the town's port in order to stamp our passports. They even gave us a lift into town! Colonia is a small, low-key affair - not the most interesting WHS in the world. Nevertheless it is a pleasant enough place, and is interesting for its history of contested control by the Spanish and Portuguese colonialists. This is manifested in the different cambers you can see on various streets - here a normal camber with the hump in the middle of the road, there a reverse camber with a dip in the middle of the road! Uruguay has since been joined on the list by the Fray Bentos Industrial Landscape, which I'd guess might be a bit bleak. But I'll be interested to read the first review when someone on this site visits it. Just surfing through the site, while working in Indonesia, I see another review of Paul Tanner. Again he wonders if inscription is justified just like the one of Caves of the Aggtelek and Slovak Karst. Maybe Paul is a bit too critical, I've been in Colonia del Sacramento as well and must say the atmosphere felt just good, very good, feeling back in time even when life was more relaxed. Good memories I have of CdS. After the noise and pollution of Buenos Aires across the river, Colonia was a breath of fresh air. So laid back and relaxing. On the wide, tree-lined streets even the motor vehicles were in keeping with the surrounding buildings; not a car to be seen built after 1950! We went across the river on an early ferry, and it was like entering a ghost town. But around 11am the locals began to appear, and very friendly they were too. We loved the colourful old Portuguese cottages around the Plaza Mayor, and the pinted blue tiles that appeared everywhere. Colonia was WONDERFUL. Eating outside in the quaint, warm and friendly cafes was an experience we shall never forget. Our children (ages 6 & 12) loved Colonia as much as we did and they're used to Disney World-type trips. What a beautiful part of the world! We will someday return for a much longer visit. Thank you for your webpage and all the photos. Uruguay possesses but a single WHS :- at Colonia Del Sacramento on the banks of the River Plate. We were journeying from Buenos Aires to Iguassu and didn’t want to miss such a close new (for us) country and another WHS so took an indirect route by hydrofoil across the Plate and then by bus through the rolling pastures of Uruguay to cross back into Argentina at the Salto-Concordia frontier. On arriving at Colonia the vast majority of hydrofoil passengers jumped onto waiting busses and continued to Montevideo. We found ourselves in a small town with plenty of hotels and restaurants and obviously heavily dependent on serving Porteno tourists. The town is pleasant enough with a number of cobbled streets bounded by low houses in colonial style together with a few ruins in the form of town walls/gates overlooking the River Plate (it is said that the lighthouse is the only “high building” -photo). The town is supposed to reflect in its layout and architecture its origins as the most southerly Portuguese colonial settlement but I can’t say that this aspect was particularly noticeable to us. It was originally founded in 1680 and changed hands a few times before its final incorporation into the Spanish empire in 1777. It was a pleasant stop-over but whether the town really justifies inscription is another matter. I personally wasn’t aware of the extent to which the Portuguese attempted to activate the Treaty of Tordesillas and grasp land that far south. I guess to Uruguayans the place has a far greater importance than to us Anglo Saxons relatively ignorant of Latin American history! As the location where a part of the physical and cultural boundary between the 2 Iberian colonial powers was worked out I suppose it has a historical significance which should be recognised. Fusion: "successful fusion of the Portuguese, Spanish and post-colonial styles"
Charles Darwin: November 17th. "We crossed the Rozario, which was deep and rapid, and passing the village of Colla, arrived at mid-day at Colonia del Sacramiento."